Last week we introduced you to a couple of the displays that we will be bringing to PACK EXPO 2014, Booth # 5336. This week we are showing you a display that uses many different technologies, the Flexible Packaging Display. Flexible packages, such as pouches, are difficult to handle. This loop demonstrates a variety of techniques for handling these types of products delicately and accurately. This section uses two 2200 Modular Belt conveyors moving at different speeds to change the orientation of the pouches as they move down the line. This puts them in the proper position for the next part of the system. Here two conveyors are on edge and adjustable to accommodate a variety of pouch sizes. Once the conveyors are adjusted to the proper width pouches are “locked” in place. This application allows for inspection, edge-sealing, printing, and labeling of pouches while keeping the top and bottom open. This portion of the display utilizes photo eyes. The eyes detect when a bag is released from the vertical conveyors. This triggers the conveyor to move forward a set distance, stopping when the bag reaches the bar. The bar is in place to move the pouch into a horizontal position. 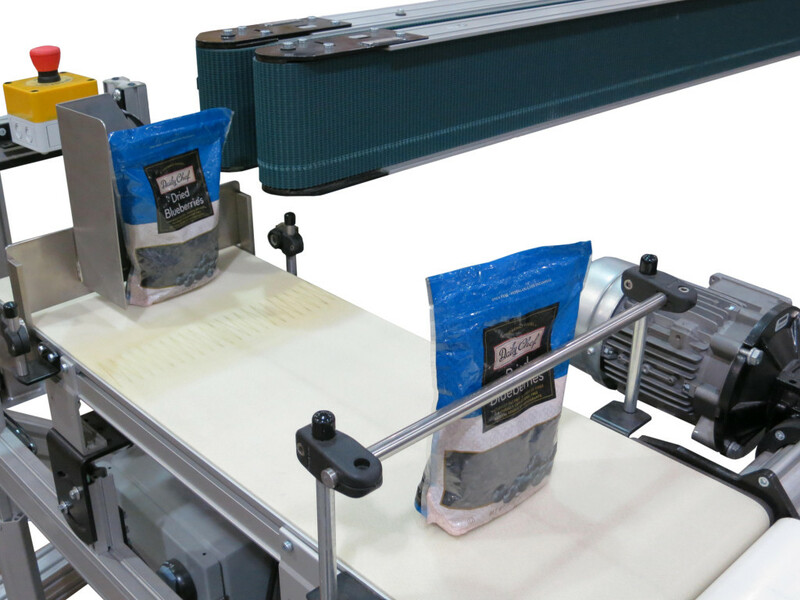 Pouch contents can be settled or flattened with this 2200 Precision Move Conveyor. The conveyor is servo driven and pulses back and forth dispersing or leveling the pouch contents for carton or box loading. Click here to learn more about flexible product handling and see videos of these conveyors.